Coming off of Horseshoe Mesa, we filled up with water at Cottonwood Creek, our last reliable water source till the Colorado 23 miles away. We each staggered away with 2-3 gallons of water to see us through 2 dry days on the Tonto Bench. The trail contoured in and out of side drainages, and onto the hot flat bench above the river. From the edge, we could see where the Colorado had cut through the wretched depths of Granite Gorge into the scarred complexion of the Vishnu Schist. The dark rocks of the chasm looked agonized and twisted, contorted by 2 billion years beneath the Earth’s crust. Standing out on the protruding fingers above the abyss, we had front row seats into the basement rocks of time. When the sun rose overhead, we hunkered down in siesta mode and waited out the heat of the day, migrating with the shade around the base of our juniper tree. Temperatures rose to 100F in the shade, and 120F in the direct sun. No matter how much I drank, I still seemed dehydrated. Our bodies were sweating water out as fast as we could replace it. Gallons upon gallons. Productivity was futile, and laziness reigned. Whiptail lizards scurried over my motionless feet; the afternoon buzz of cicadas rang deafeningly in our ears. The sun sank below the cliffs and we were released from our prison of heat and light. Evening breezes stirred the air, as if the whole world seemed to let out a collective sigh of relief. Darkness fell like an expansive blanket over the canyon. The buttes and temples sunk into shadow, and stars emerged from their refuge in the sky. A full moon illuminated the landscape in a pale ghostly light, while fallen agaves cast dark shadows across our path. At the Bright Angel corridor, we soon encountered pack trains of tourists heading up to the canyon rim. People pay good money to see the canyon, without ever setting foot on the ground. Few people were enjoying themselves, most as sad and miserable as the heavily burdened mules themselves. We were glad to see the trains leaving early in the morning, though I still consider it cruel and unusual punishment to have to haul a fat Midwesterner out of the Grand Canyon. We crossed the Black Bridge of the Colorado and reached Phantom Ranch, a literal oasis in the desert. Tall stately cottonwoods lined a wide clear flowing creek. Deer walked the pools feeding on the lush willows, oblivious to people near by. Phantom was a bustling hub of activity - river runners came in from the river to purchase ice for empty coolers; packers delivered goods from the canyon rim and loaded their mule trains up with mail; rangers tended to dehydrated tourists; exhausted day hikers rested and purchased sack lunches for the 5000ft climb out. We spent the day relaxing and people watching, and managed to secure dinner reservations at the Cantina for an all-you-can-eat meal. It was a feast of garden salad, buttered corn bread, hot beef stew with real potatoes and veggies, and chocolate cake! We ate for an hour until they literally took our plates away. As usual, we broke camp before dawn and make our way up the North Kaibab Trail. We made miles quickly on the wide maintained trail, cruising past hikers as we went. We made a quick trip to Ribbon Falls, a beautiful 100ft falls cascading into a shallow pool. The falls poured from a lip in the rim, freefalling onto a turret of deposited limestone, where the water fanned out into a wide silvery veil. Flute music echoed in the recessed chamber, dancing off the limestone walls, as if Kokopelli himself was reveling in the scene. We soon reached the junction with Roaring Springs Canyon, where a massive torrent gushed out of the canyon wall at the Muav/Bright Angel interface. This single source on the North Rim provides water for both sides of the canyon. Due to the agreements made in the Colorado River Compact of 1922, the law allocates the entire flow of the Colorado River for cities downstream. Essentially, the Canyon acts as stone aqueduct, piping water to the thirsty desert metropolises of Phoenix and LA. Instead of pulling water from the river, the park pumps water from Roaring Springs at 5200ft, 3000ft down to Phantom Ranch, and back up again another 5000ft to the South Rim – a marvel of engineering. No wonder the pipe breaks periodically. Continuing on, the trail broke through the upper Kaibab layer to the cool forested North Rim. We reveled in our return to the front country. We picked up a cache, made some phone calls, and enjoyed a delicious steak dinner at the North Rim Lodge (with a view!). Afterwards, we enjoyed our beers in the wicker chairs on the observation deck and caught the sunset from the rim. I traced our route back down into the canyon, across the Tonto Bench back to Horseshoe Mesa. In the distance, we could make out the high peaks of the San Francisco Mountains in Flagstaff. What a place. We awoke to a cold morning, and frozen beads of condensation on our bags. We ditched our layers and raingear, the extra clothing useless in the heat of the inner gorge. From our camp on the rim, we had a commanding view of the world below. The canyon walls fell away into a deep chasm of rock and stone. Teapot buttes and Hindu temples jutted up from the gorge, suspended in the middle ground between earth and sky. So much topography, so much terrain. We began our descent down the infamous Nankoweap Trail, our route into the Canyon. The trail dropped through the upper layers of limestone to the low ridgeline of Saddle Mountain. We beat through thorny locust, and navigated slick patches of snow. Snow in the canyon! In June! With every new bench, we dropped into new strata of vegetation. The trail passed from ponderosa and manzanita, to open forest of pinyon and juniper. We tiptoed around lethally sharp agave – a single trip could easily impale. They had recently put up massive 10-12ft stalks, bristling with small lemon yellow flowers, an impressive structural feat for such a small plant. Black bumblebees buzzed from blossom to blossom; newly hatched cicadas sat drying their wings. The views changed as we descended. Perspective and scale were in constant flux as we passed through layer after layer. I felt insignificant amidst the magnificence and grandeur, a lowly speck travelling through the rocky folds. The trail wound across a sinuous bench, along the base of a cliff. The route seemed to “slope off towards disaster”, where sections of the trail had broken away leaving little space between the wall and the gaping void. Some definite sphincter-puckering. Footing was treacherous below Tilted Mesa, where the trail was covered in loose pea gravel. It felt like hiking in roller skates. Thank goodness for the trekking poles. We were much relieved to reach the cold flowing waters of the Colorado, the bottom of the Grand Canyon. Down in the gorge, our progress was slow, dictated by the movement of the sun. Mornings began before dawn to beat the heat of the day. We hurried to make early miles as we watched the sunlight inch down the face of the western wall. We could feel our brains cooking in our skulls, as we hiked in a heat-induced drunken stupor. When it got too hot to hike, we sought whatever shade we could find. Daytime temperatures rose to 110F in the shade. It was too hot to explore, too hot to write, too hot to sleep. If we were close enough, there was solace by the river. The Colorado, released from the confines of Glen Canyon Dam, stays a frigid 42F – just tolerable enough to dunk ourselves, before drying off on the hot sand. We found ourselves drinking 2 gallons of water a day – and we were still dehydrated. In these temperatures, our bodies couldn’t absorb water as fast as we were losing it. In addition to dehydration, there is also a serious situation known as hyponatremia, caused by a sodium imbalance. On our second day, Ben came down with a mild-case and was incapacitated for an evening. Not a fun time to feel miserable. It was an uphill struggle against the elements. The route followed the west bank of the Colorado, bushwhacking through a difficult maze of Tamarisk and locust trees. We ventured up to the famous Nankoweap granaries, perched hundreds of feet above the river. I found it incredible to imagine that people actually lived down here. A mix of game trails made the going easier, sometimes leading up the steep shale slopes, sometimes dropping down to the river. We slogged across loose sandbars, recently deposited by the Glen Canyon Dam springtime release. After the Colorado was dammed, the seasonal fluctuations in river levels ceased, which lead to eroded beaches and washed out dunes. It was good to see the new management practices were having a positive effect. We flagged down a passing private raft trip, and they were gracious enough to give us a ride across the river. We soon reached the confluence with the Little Colorado River and its beautiful turquoise waters. Travertine pools backed up behind natural dams caked with deposited layers of limestone, and small waterfalls poured over the marble terraces in pale cascades. Fording was simple, and we managed to cross without difficulty. The Little Colorado turned out to be a popular day trip for commercial raft trips. From afar, we watched nearly 200 tourists march in misery to see the falls in the tormenting heat of the canyon. All were on vacation, yet none seemed to be having a good time. The poor souls. The Beamer trail was a welcome change to the recent bushwhacking and route-finding. We hiked along a high bench layer of Tapeats Sandstone, contouring in and out of hanging side canyons that poured off into thin air. At times, the trail dropped off into the river several hundred feet below us into the dark green waters of the Colorado, directly beneath our feet. From above, we could see the upwelling of silt and sand as the waters churned and mixed in the current. We found solace down by the river at Cardenas Creek and Hance Rapids. The Escalante route was a hands-on scramble up and down the bench layers and talus. We shouldered our packs and left the cool confines and shadows of the river for the exposed and parched expanses of the Tonto Bench. From up above, we had massive views of the undulating ridge of Palisades of the Desert and the river below. We stumbled past gardens of prickly pear, as we peered over the edge into the gaping abyss of Granite Gorge. Our bucket cache on Horseshoe Mesawas intact and waiting. We passed the rusted remnants of early mining equipment. I was dumbfounded how anyone thought it would be a good idea to haul ore and minerals out from the depths of the canyon. At the edge of the bluff on the mesa point, we regained our bearings, and found ourselves seemingly suspended in the midst of the world, somewhere between rim and river, earth and sky. We made the decision to deviate from the Hayduke Trail to add a twist of our own. Instead of immediately following the Arizona Trail across the Kaibab Plateau, we had procured the permits necessary to travel down the Lower Paria Gorge through the Vermillion Cliffs National Monument to the Colorado River at Lee's Ferry. It was a section the Hayduke creators Joe Mitchell and Mike Coronella had done during their reconnaisance hikes across the plateau. This route was so incredible that we felt that we needed to add it to our trip as well. We headed back down the narrow entrance of Wire Pass to Buckskin Gulch. 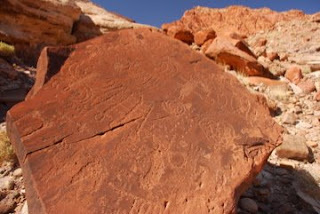 At the confluence was a large panel of petroglyphs with nearly 2 dozen bighorn sheep carved into the wall. Whoever carved the images was obviously intimate with his subject, posing the animals in natural stances, and capturing the nuances of body posture in stone. These people knew their sheep - they were their livlihood out here. The narrows started right away, and the morning light was radiant on the upper walls, reflecting a tapestry of colors - golden orange, vermillion red, violet. Stray beams of light sometimes penetrated the overhung ceiling of stone. Large logs spanned the gap, stuck 30-40 feet above the canyon floor, silent reminders of the ferocity of water in the desert. In some places, floods had left their muddy silouettes along the wall. Splashes and liquid throes were captured in action as the silt-ladden highwater marks of past floods. There are few places to run in a narrow slot like Buckskin Gulch. We saw several small groups of dayhikers, including a few big Mormon families. What a place to take a child. A slot canyon is a unique interactive tactile environment, and active learning experience for a kid. We were passed by a large group of shuttled hikers, speed hiking to the confluence and up the Paria to White House trailhead, almost 19 miles in a single day. The people were practially running through one of the most incredible slot canyons around, shooting pictures on the fly, grinding hard to get to the shuttle at the parking lot. Not quite the way I'd want to experience this place. I got to chatting with a dayhiking couple from Kauai, Rob and Elle, who were back home visiting family in the 4-corners region. They were curious when they found out about the HDT, and I found it refreshing to talk to real people who were genuinely interested in our trip. Rob was a cartographer and made his own maps of the islands. It was cool running into them in a place like this. 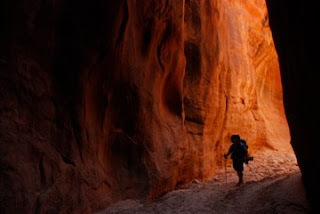 Most of the canyon ran along a joint fissure in the rock, a long narrow alleyway that would occassionally deviate and jog in another direction. In the deepest sections, light had difficulty penetrating the depths of the chasm. I lost myself in a world of abstract colors and surreal forms. The walls were scalloped and carved by floodwaters in a variety of shapes and repeating patterns. Scooped bowls, fluted hollows, walls of swiss cheese. The floor was cracked with shards of dry mud fitted together into a natural jigsaw puzzle, with bits shrivelled and curled like woodshavings. The world was dark and deathly silent. The flapping of a raven distrubed the still air, as its wings spanned the width of the gorge from tip to tip. I watched an adult swoop into its nest constructed out of flood debris in an eroded hole, to feed a pair of hungry chicks. The canyon was filled with a deafening cacophony of sound. We crossed into Arizona at the deeply cut Confluence with the Paria. The river was barely a trickle. Nearly all the flow had disappeared into the sandy floodplain below the Box at the Cockscomb. The canyon opened up into a wide gorge of smooth Navajo caught in an entrenched meander, forcing the river into a winding series of bends and S-curves. Sheer walls sloped down to the river, glazed with a sheen of dark desert varnish. Willows and tamarisks lined the sandbars, and shady campsites appeared beneath tall cottonwoods. It was incredible how quickly the atmosphere changed below the junction with Buckskin. Parallel cracks opened into the drainage, where wafts of cool air drifted down from the shady recesses. The base of the fins were worn thin by scouring floods, seemingly balanced on narrow footed pedestals. In one of the cracks, we were astonished to find dozens of brown morels growing in a heap of damp detritus. Mushrooms in the desert! Back in the river, walk was pleasant in the water warmed by the desert sun. Numerous flowing springs leaked from cracks in the walls, lush with mosses and delicate ferns. We passed several abandoned meanders where the river channel had cut a new passage, leaving the old bed suspended high above the canyon floor. We stopped for lunch at Big Spring, a gushing flow of cold water straight from the wall. We arrived at the same time as a group of 10 volunteers and folks from Grand Canyon Trust doing vegetation surveys in the gorge. The GCT is a non-proft organization that works on numerous conservation projects across the Colorado Plateau. Specifically, they were surveying the impact of invasive Russian olive and tamarisk along the Paria riverway, and were getting ready to start mechanical removal throughout the corridor. After chatting a bit, we realized we had several overlapping mutual connections. It was cool hanging out with a fun group of folks out doing important restoration work. And what a place for a field site. They wished us luck on our trip and we each headed on our way. Further down canyon, we entered the Goosebends, a series of switchbacking bends that carved out towering 1000ft overhung walls. It was fantastic walking. My neck was constantly craned in all directions to take it all in. Massive stone ampitheaters, narrow shoulders of stone, streaked walls, and pocked surfaces. We found some great swimming holes where the river had scoured deep bathtubs behind lodged boulders, where small minnows would come up and nibble us in the pools. On the dry rocky benches, we saw some flowering agaves prominently displaying their 10-foot stalks like exploding phalluses. After storing up years of energy, they invest it all in a major effort to reproduce, an incredible feat of plant biology. At one point, the river slowed and deepened to a thigh deep pool. Beavers had dammed the Paria and were hard at work building their lodge. The dam itself was about 20ft wide, built out of a dense weave of willow cuttings. It was cool to see they were thriving, but they will definitely have their work cut out for them once the monsoons hit and the Paria flashes it out. Below the dam, we dropped packs and explored the side drainage of Wrather Canyon. The draw was full of old cottonwood trees and dense box elders. We followed a trail up the canyon to the impressive Wrather Arch. It was an eroded alcove about 150ft high that left the archway suspended on a single support leg. We sought refuge in the shade from the sweltering heat. In the open, daytime temperatures were nearing 100F. It was crazy to think we had nearly frozen in Bryce less than a week ago. In actuality, it was a great opportunity for us to acclimate to the warmer temperatures before we began our descent into the Grand Canyon. Luckily, we found a gushing spring with hanging gardens of ferns and willows. Dozens of little Woodhouse toads lept everywhere, and brilliant blue damselflies perched delicately on low branches. We filled up gallons of water and drank heartily to quench our thirst. The river cut down through lower formations to the top of the erodable Chinle where the canyon really opened up wide and began to drop in plunges. Large boulders choked the riverway, creating pools and small falls. While hiking, we saw Great Blue Heron, Golden Eagles, and even Peregrine falcon. Cottonwoods began to disappear from the banks, and with them, their valuable shade. Rabbitbrush and tamarisk grew up on the sandy terraces, as well as spiny agave and prickly pear cactus. Massive sand dunes eroded at the base of the 2000ft walls, as the river fell away below. Back near the river, we found dozens of large boulders with carved petroglyphs. Several were carved on multiple faces, and one looked as if it had slid down the slope and landed upside-down. They were full of images of bighorn sheep, hands, people, scorpions, centipedes. Some panels were so dense with carvings, that newer images were etched right over the surface of older ones. We followed the river down to Lonely Dell Ranch at the historic Lee's Ferry, part of the Glen Canyon NRA. The formidable Vermillion Cliffs rose an incredible 3000ft from the bottom of the gorge. 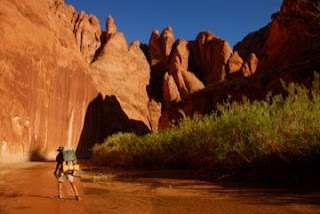 We had travelled the entire Paria drainage from its headwaters in Bryce, down through its major tributaries and canyons, to where it emptied its load into the Colorado. The confluence of the two rivers was Mile Zero and the official start of the Grand Canyon. The last time I had seen the Colorado was back at Hite. I had managed to walk completely around with out actually seeing the tepid waters of Lake Powell. From Lee's Ferry, we were headed west for the Kaibab to begin our approach into the gorge of all gorges - the Grand Canyon. A regional storm system had moved into the area, and it looked like it planned on staying. From on top of the ridge above Willis Creek, we could see a massively sporatic system of storms hitting everywhere around us. The cliffs of Bryce disappeared behind a spotty curtain of sleet and rain, and Powell Point to the north glimmered with a fresh layer of fallen snow. We followed a dirt road up the drainage of Willis Creek, and passed through a private inholding of land within the monument that had a conservation easement placed on it. Green grazing fields sat between sloped hills of the Grey Cliffs, a very secluded and pastoral ranch setting. On the other side of the property, we intersected the boundary line of the Dixie National Forest, a narrow strip of Forest Service land buffering the park. We walked through open stands of stately Ponderosa pines and Douglas fir, Oregon grape and manzanita. Hiking was easy on thickly padded mats of fallen needles. We scared off a mother turkey and a dozen of young turkey chicks. They scattered in all directions, hiding beneath bushes and cheeping like crazy. Snow flurries passed through all afternoon as we hiked through the pine forest. We soon crossed over into Bryce Canyon NP, the fourth park of the trip. The silence was broken by the familiar whop-whop-whop of low flying helicopters. Every half-hour, we were buzzed by a dozen sight-seeing choppers flying along the rim of the canyon. We were shocked that they were allowed to fly so low and often into the reaches of a national park. While helicopters don't have the same destructive impact of ORVs, they sure impacted the serenity and seclusion of the canyon for miles around. We realized later that the helicopters were nearly inaudible from the paved roadway and highly frequented pullouts. But from a backcountry perspective, they were an offensive and gaudy intrusion of industrial tourism where the impacts of the steel-bound world should not tread. We intersected the well-marked Under-the-Rim Trail that ran the length of the park. The trail climbed up into mixed stands of Ponderosa, White Fir, and Douglas Fir, while Oregon grape and mountain mahogany lined the ground. We climbed the Agua Canyon connector trail up the ridge, climbing over fallen trees, low-lying snowbanks, and up crumbly switchbacks through the Pink Cliffs, to the Ponderosa Canyon Overlook on the park highway. It was a bit surreal to be frontcountry again. I hadn't seen pavement since Highway 95 at Poison Spring, and had been deep in the backcountry for 6 weeks. We were looking pretty dirty and grimy compared to the immaculate park visitors. We hitched a ride to the Sunset campground, where we met our good friend Jeremy Cohen, and his buddies Alex and Josh. The three of them were riding high off an action-packed week in Vegas and were stoked to visit us on the trail. Ben and I were dying for a hot meal, showers and laundry - all the amenities of the developed park concessions. It was completely disorienting being packed in crowds of people after a month-and-a-half of utter solitude. I stumbled through the menu at Ruby's Inn with complete tunnel vision, and ordered overpriced but delicious vegetables. Everything was an overwhelming sensory overload, and we couldn't get out fast enough. In the morning, we woke to a landscape of snow covering everything. We were glad to temporarily be off the trail in this weather. Ben and I spent the morning running errands, and getting supplies at the General Store, while the guys slept in. We checked out the Bryce Ampitheater and its famous pink hoodoo formations for which the park is known. I could see why early cattlemen referred to Bryce as "a hell of a place to lose a cow." We met back up with the guys and headed back out to the trailhead. Jeremy was planning on joining us for a few miles of the Hayduke Trail, and we made plans to meet up with his buddies at Rainbow Point the next day. The three of us headed back down the Agua Canyon trail and linked back up with the HDT. The afternoon was magnificent and sunny with great views below the rim. It was hard to believe that we woke to a blizzard. The trail dropped down into a forested basin, where we camped near Iron Spring. The rust-colored water was potable, but tasted very metallic. The spring was surrounded by a dense grove of leafy aspens and mahogany bushes. From above, the electric green canopy seemed out of place in the sprawling cove of pines and fir. 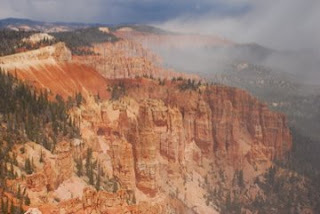 The trail followed the base of the cliffs, offering unobstructed views to the rim above. The spires seemed to glow a spectrum of a thousand shades of pink. We looked up vertical eroded gullies and spotted several weathered arches - all inaccessible to exploration. Climbing the hogsback of the ridge, another blizzard descended upon us dropping a thick veil of falling flakes. The entire canyon vanished into the ether. Brief windows in the weather would open up, revealing the splendors of the canyon walls. By the time we reached Rainbow Point 9115 ft, the rim was fogged in and blowing snow. Tourists looked at us strangely as we apparated off the trail clad in shorts in freezing weather. Luckily, there was a shelter at the observation point where we hunkered down for lunch. Alex and Josh were waiting for us at the parking lot and were gracious enough to bring us some leftover steak and a bag of salad, which we promptly devoured. The beauty of trail magic. The storm began to break up revealing each point northward along the rim in succession, until you could see the entire winding ridge of the escarpment. The sun came out and burned off the clouds, illuminating the freshly cleansed world at our feet. The guys needed to get going, and were going to stop in Zion on their way back to Vegas. It was great having some company on the trail for a while. We thanked them for their gifts - Jeremy had brought me a new pair of insoles - and they were on their way. On our way out, Ben and I stopped at Yovimpa Point where we had extraordinary views to the south where the trail was headed: Bullrush Gorge, Park Wash, Vermillion Cliffs, and the Kaibab Plateau. To the east, were the Cockscomb, Rock Springs Point, the Kaiparowits Plateau, 50-mile Mountain, Navajo Mountain, and beyond Canaan Peak, the distant Mt. Ellen - 90 miles by direct line of sight. 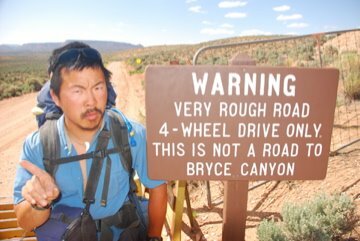 It had taken me 5 weeks to get from the Henrys to Bryce, albeit via a very indirect route. We left the droves of sight-seeing tourists and rejoined the trail. Along the rim, we walked through stands of limber pine and the grotesquely gnarled bristlecone pines. Bristlecone trees can withstand incredibly inhospitable environments, surviving drought, fire, and wind for thousands of years. The trail dropped down into a deep ampitheater, where we camped in a park-like grove of Ponderosa near the piped and fenced off Riggs Spring. The temperature plummeted over night, and while we lucked out on snow, our Nalgenes froze completely solid. Brrr! We followed a dirt road out of the park, and continued on down Podunk Creek, and over a low saddle in the Grey Cliffs into Bullrush Hollow. The drainage cut down through the top of the Navajo formation into Bullrush Gorge. Flowing spring water made the going difficult, making thick with mud that stuck like wet cement to the soles of our boots. Hundreds of trees grew out of the slickrock like matchsticks, covering the walls with greenery. The canyon opened up into Park Wash, where we found ourselves at the foot of the White Cliffs. We made a short trip and climbed up a steep goat trail to the top of No Man's Mesa, one of the few inaccessable tracts of rimtop left ungrazed by livestock. Ben set off two midget faded rattlesnakes that were hiding beneath a ledge, and jumped nearly two feet when they started rattling. The mesatop had incredible views of the surrounding area and back up to the Pink Cliffs of Bryce Canyon. We continued on down sandy Park Wash as it cut its way south back through the formations of the Staircase. Further on, we climbed a low lying ridge and were astonished at what we found. Scores of potsherds littered the ground everywhere, of all shapes and sizes, from the size of a fingernail to an entire palm. Broken mug handles, smoothed edges of a bowl, the curved neck of a pot or vase. The fragments we found came from nearly a dozen different styles. Once on top, we realized we were only combing through the base of a massive trash heap. We found the remains of an entire settlement that had once covered the whole knoll. A whole community of people once thrived here. The canyon was abundant with springs, and the fertile valley bottoms would have been great places to grow crops. The site was perfectly situated along an easily traveled corridor between the different trading regions, and could have been a hub of commerce for miles around. Unfortunately, the site had been heavily looted, indicated by deep holes dug all over the ground. Pothunters had dug up rooms and left the masonry piled in heaps as they searched for valuables. At one point, this site must have yielded some incredible artifacts. We followed a well-graded road past the still operational Kitchen Corral and Burch Ranches. As we were hiking, a local rancher and his son stopped to talk to us. He turned out to be Mr. Johnson of the historic Johnson clan, and ran the local ranches in the canyon. Their family were some of the original settlers in the region, and had been ranching out here "since forever." Along the Paria drainages, we had seen several cowboy etchings made by distant Johnson family members. They were interested in where we were hiking to and offered us a ride to the highway, but we politely declined. The Johnsons wished us luck on our trip and we parted ways. We made it to Highway 89 and the race of bustling traffic going by. At the junction, there were several official signs warning tourists that despite what their GPS units might indicate, this road was NOT the best way to Bryce, and was an almost impassible 4WD route. Enough visitors must get lost or stuck to prompt the BLM to put up signs like that. During a short break, we saw two vehicles drive up, read the sign, turn around, and get back on the highway towards Kanab. I've heard stories of semi-trucks following their GPS units down Cottonwood Road, another rough road, to cut through the monument, only to get stuck in mudholes. The fallacy of technological innovation. We dodged traffic and crossed the highway into the head of Kaibab Gulch. The canyon cut down into the blocky pale Kaibab Limestone. Upon close inspection, the rock was filled with well-preserved fossils dating back to the Permian Era. The ledges were composed of layer upon layer of crushed seashells. I found fossilized remains of tubeworms, corals, scallops, and clams. It was a literal cross-section into the bed of an ancient seafloor. Some incredible stuff. The gorge cut right through the heart of Buckskin Mountain. We found a peculiar number of cattle bones in the wash, possibly from unlucky cows caught unaware by flash floods. Overhead, the massive powerlines running from Glen Canyon Dam spanned the chasm, carrying the collective fruits of hydroelectric power to God-knows where. The formations began began sinking underground as we neared the uplift of the Cockscomb. The Kaibab limestone disappeared as we reentered the Moenkopi beds and exposed Shinarump member of House Rock Valley road. Looking back over the low ridge of Buckskin Mountain, we could see the progression of transformers and cables marching across the forested plateau. The wash turned into Buckskin Gulch as we cut back through the angled rise of the Chinle, Kayenta, and deeply layered Navajo formations. We walked through rusty orange colored fins broken by vertical parallel cracks. The sandstone took on a number of different shapes and forms: swirled teepees, hexagonal-cracked domes, slanted tables and arches. Sacred datura flowers grew among mounded coral dunes. The drainage tightened up into a narrow slot cutting its way through the stone. The afternoon light refracted off the canyon walls in an amazing array of subtle colors. Further down the slot, I heard a strange noise like an electrical hum hovering above me. Looking up, I saw a dense cloud of swarming bees, madly assembled in the upper reaches of the canyon. The swarm buzzed from wall to wall, pulsing as if alive. A bird flying through the narrows saw the mass of bees and immediately turned back the way it came. It was strangely frightening, since there was no where to run if they decided to follow. But I was intrigued by the beauty and eerieness of the experience. We left Buckskin at the junction with Wire Pass, an easily accessible drainage with the main canyon. We encountered a number of day hikers who were out exploring the narrows, and followed the route out to the trailhead just off the stateline. Digging up the caches, we refilled our packs and readied to leave Utah for the hotter climes of Arizona.